Diffractive optical elements for manipulation of CO2 laser radiation – a feasibility study; A review of joint tracking systems for laser welding; Control of porosity in CO2 laser welds in C/Mn steel; The development of a solidification cracking test for carbon-manganese steel laser welds. Research carried out by TWI staff for The Welding Institute’s industrial members. 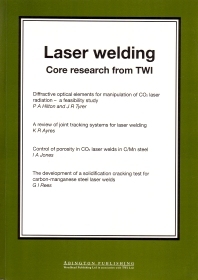 This title includes diffractive optical elements for manipulation of CO2 laser radiation - a feasibility study; A review of joint tracking systems for laser welding; control of porosity in CO2 laser welds in C/Mn steel; the development of a solidification cracking test for carbon-manganese steel laser welds.